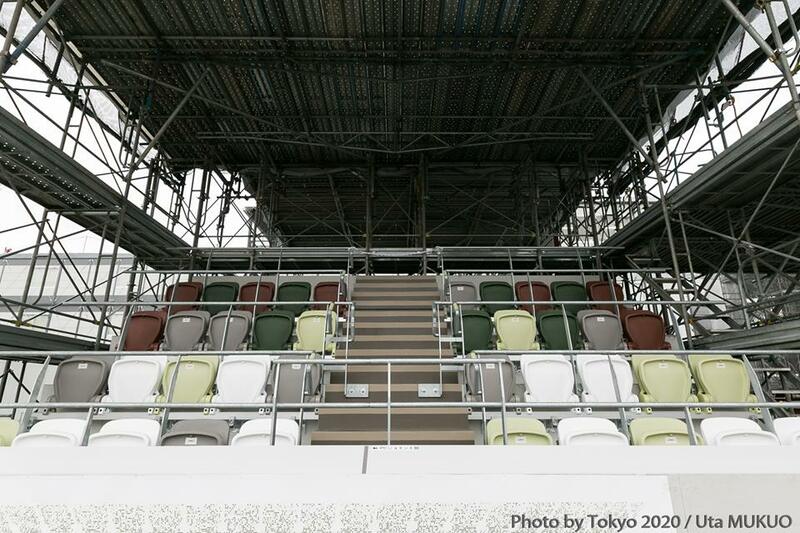 Ten months after the launch of the Olympic Stadium construction in Tokyo (Japan), the Organizing Committee of the 2020 Summer Games has unveiled mock-ups to present the progress of the project and the final rendering of the future showcase. These models reveal the main characteristics of the project designed by the Japanese architect, Kengo Kuma, and for which 1,000 to 3,000 workers will succeed each other at different stages of the construction project. Built on the foundations of the Olympic Stadium of the 1964 Olympics, the new building will focus on respect for the environment, with recycled materials and the integration of wooden structures. To evoke the environmental theme, the eaves of the enclosure have been thought of as filters that will let through breezes. The 80,000 seats will be designed around five colors that will symbolize the concept of natural light in forests : white, beige, gray, brown and green. The unveiling of these visuals comes at a time when the organizers of the 2020 Games and the Japanese authorities are confronted with the problem of burnout in the workplace. Recently, the Labor Office – a body attached to the Ministry of Labor and Health – has recognized a case of « karoshi » following the suicide of a 23-year-old worker. This worker, hired in December 2016 on the site of the Olympic Stadium, had accumulated not less than 200 hours overtime one month before his suicide. But this problem – major in Japan – is not the only one that concerns the work of the Olympic Stadium which must end in November 2019. Forty-seven associations sent a letter to the International Olympic Committee (IOC) headquarters in which they point to the alleged use of illegally harvested timber in Malaysia. In addition to the ethical question, the presumed use of these resources raises the question of the sustainability of the Tokyo 2020 project. Kengo Kuma, chosen in 2016 as the architect of the Olympic Stadium, had notably mentioned his wish that the flagship installation of the Games be built with Japanese wood.